Our forte is dealing with difficult conditions where non-conventional foundations are required or offer increased project value. Expertise in design, construction techniques, and cost analysis allows us to aid our clients in selecting the most efficient systems. Micropiles are deep foundation elements constructed using high-strength small diameter steel bars and cement grout. Micropiles provide developers with a myriad of ways to retrofit existing structures to allow increased axial loading and reinforcement for seismic or other natural events. They are ideal foundation units for sites with limited horizontal or vertical access, where conventional deep foundation systems are too risky or too expensive. From low-capacity ‘root-piles’, micropiles have evolved to constitute 500-ton foundation units. Micropiling techniques have also been used effectively to complement soil nailing construction in slope stabilization applications. 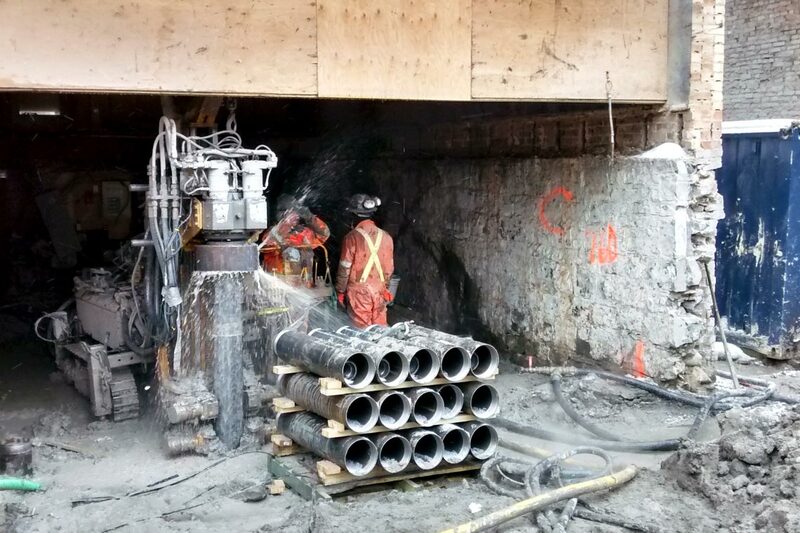 Micropile foundation installation at 1 Yorkville in Toronto, Ontario.